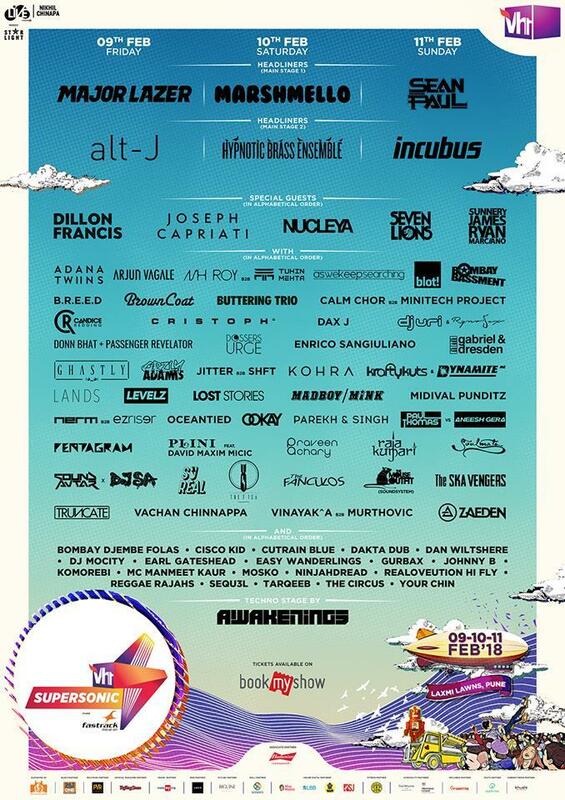 India's festival scene has been catching up with the rest of the globe extremely quickly and the line-up of the VH1 Supersonic Festival just solidifies that. Pune's annual music festival has released their complete line-up for this year's edition and for the first time ever, the festival will feature multiple genres, instead of just dance music. This year's line-up sees the addition of genres such as electronica, Pop, reggae, hip-hop, jazz, hard rock, indie rock, trance and techno. The main stage headliners for the three-day festival have been revealed as Major Lazer, Marshmello and Sean Paul respectively, featuring other headlining performances from Alt-J, Hypnotic Brass Ensemble and Incubus. Other acts slated to perform at the festival include Dillon Francis, Nucleya, Seven Lions, Joseph Capriati, Ghastly, Ookay, Parekh & Singh, Pentagram and more. Ticket details for the festival have yet to be released. VH1 Supersonic Festival 2018 will take place from 9 Feb to 11 Feb at the Laxmi Lawns in Pune, India.